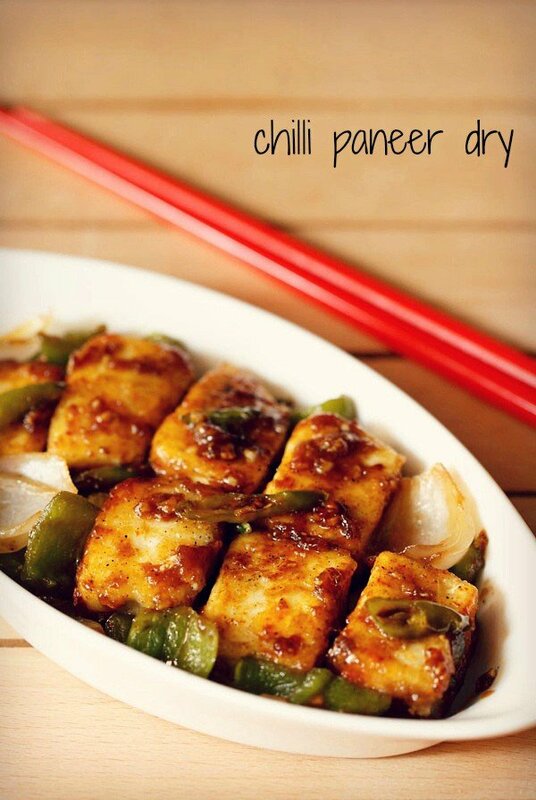 chilli paneer is one of the popular recipe from the indian chinese cuisine. 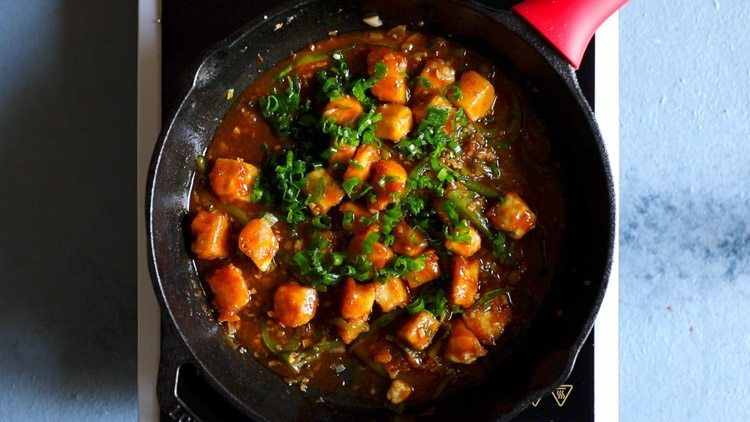 this chilli paneer recipe gives restaurant style taste and flavor. 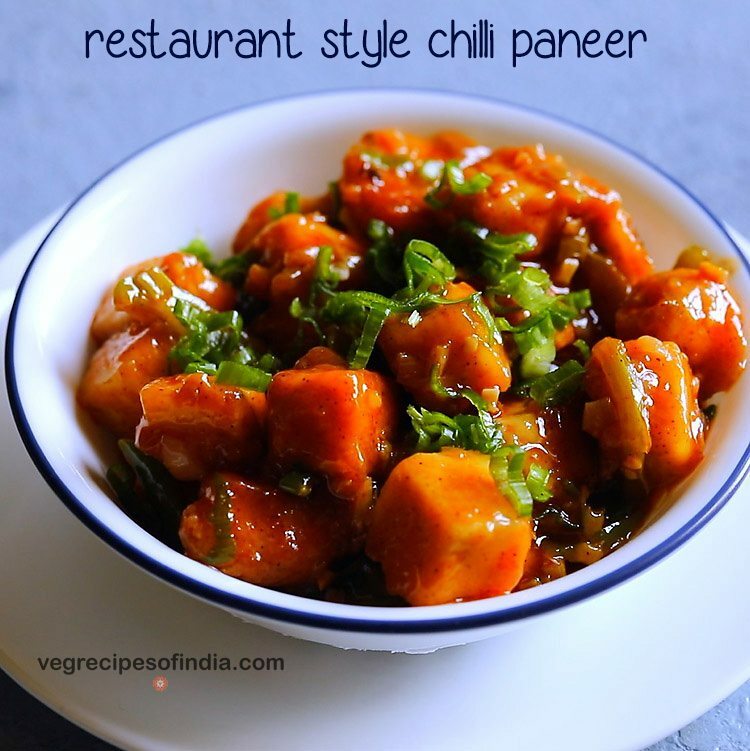 chilli paneer recipe restaurant style with step by step photos and video – one of the favorite dishes from indian chinese cuisine is chilli paneer. 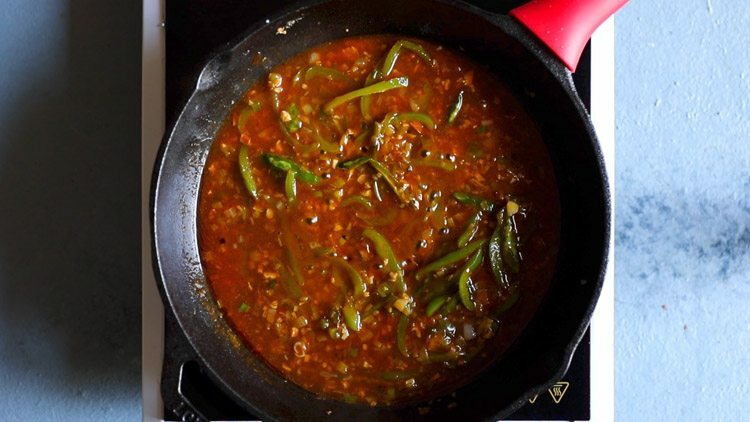 this paneer chilli recipe gives restaurant style taste and flavor. i have already shared two chilli paneer recipes. 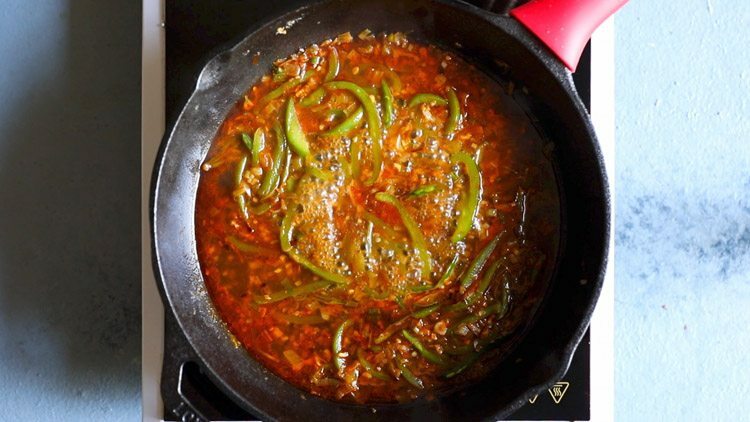 one is a crisp chilli paneer dry and other is a quick recipe of homestyle chilli paneer gravy. there is a gravy or sauce in this restaurant style chilli paneer version. you can make the gravy slightly thick or having medium consistency. if serving with rice, then the gravy or sauce can be medium to medium-thin. if serving as starter the sauce can be slightly thick. 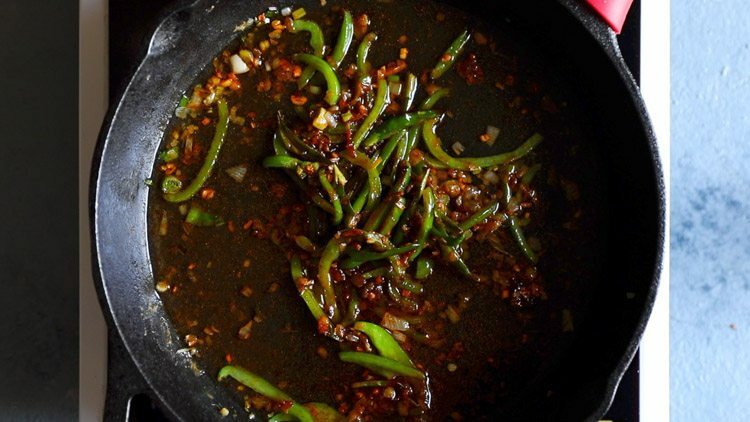 you can add the amount of soy sauce, red chilli sauce, green chilies, black pepper, sugar and vinegar as per your requirements or taste buds. 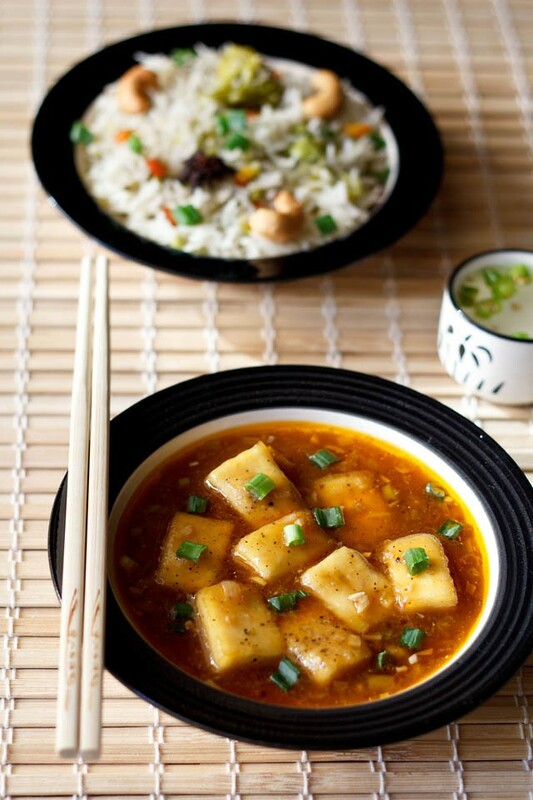 instead of paneer, you can also use tofu. 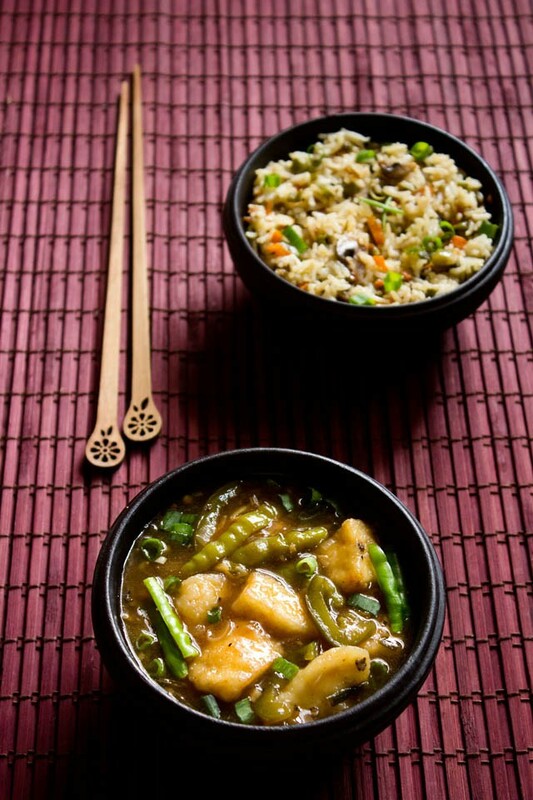 serve chilli paneer with fried rice or schezwan fried rice or burnt garlic fried rice. 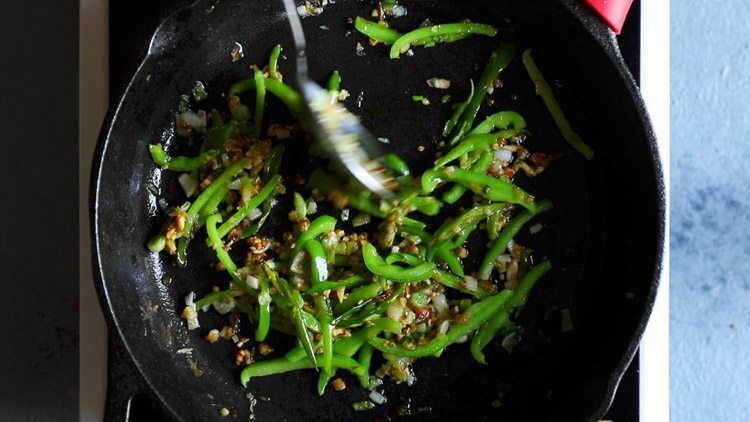 it also goes well as a side dish with pulao or jeera rice or ghee rice. you can also have it with tandoori roti or naan or roomali roti. in a bowl take 2 tablespoons cornstarch. then add 3 tablespoons maida (all purpose flour). next add 2 teaspoon finely chopped ginger, 2 teaspoon finely chopped garlic, ¼ teaspoon crushed black pepper or black pepper powder and ¼ teaspoon kashmiri red chilli powder. also season with salt as required. add ¼ cup water or add as required. 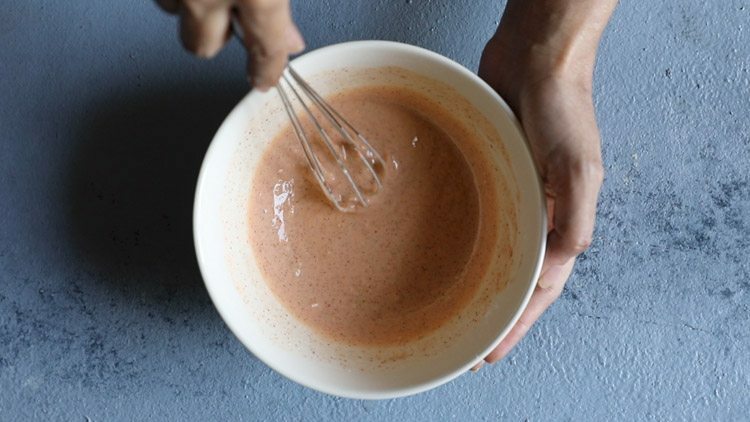 with a wired whisk or a spoon mix very well to get a smooth batter without any lumps. now add paneer cubes in the batter. 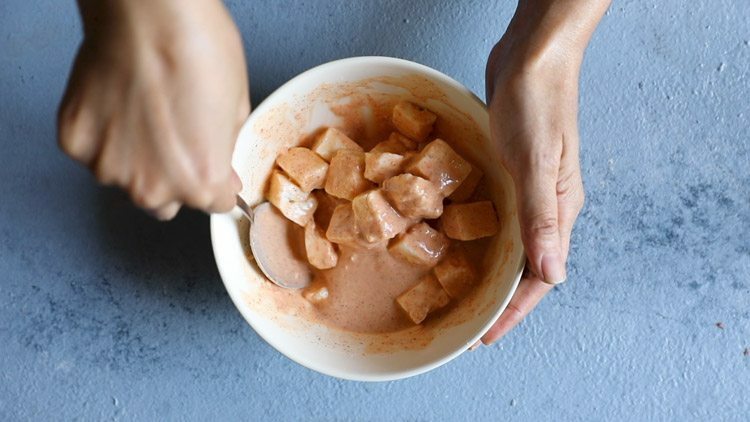 with a spoon gently coat the paneer cubes with the batter. heat 3 tablespoons oil in a frying pan. one side is done, flip it and fry the other side. 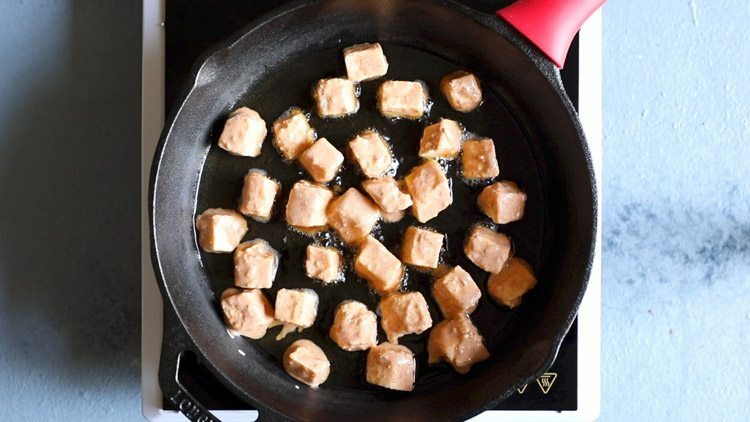 flip a couple of times and fry till the paneer cubes are crisp and golden. also do not over do the frying as then the paneer cubes can become hard. remove the fried paneer cubes and place them on kitchen paper towels for the extra oil to be absorbed. in the same pan, there will be some oil left. so no need to add any extra oil. 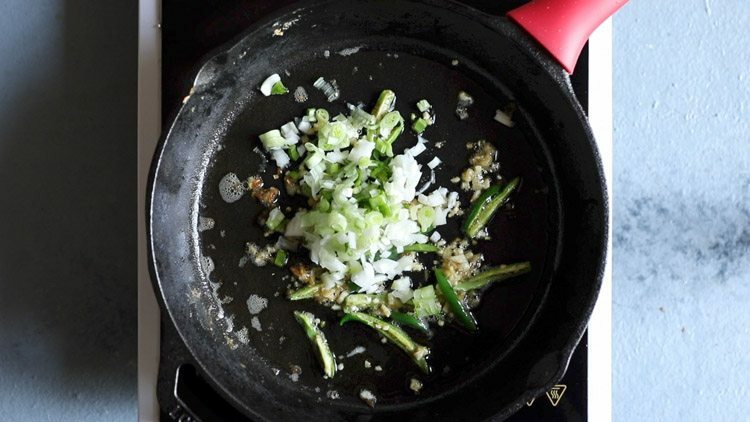 add 2 teaspoons finely chopped ginger, 2 teaspoons finely chopped garlic and 2 to 3 green chilies (slit or sliced). stir fry on medium to high flame for some seconds. then add ⅓ cup chopped spring onions. stir fry spring onions for 1 to 2 minutes on medium to high flame. next add ½ cup sliced capsicum. stir fry on medium to high flame for 3 to 4 minutes. the capsicum only needs to be slightly cooked. 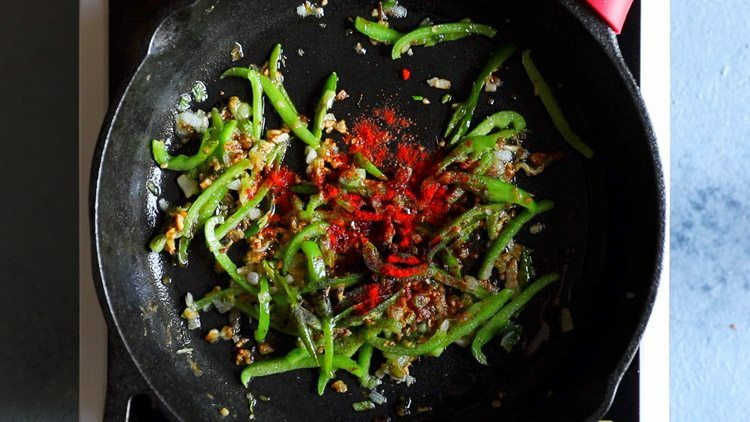 lower the flame and then add ½ teaspoon kashmiri red chili powder. then add 2 teaspoons soy sauce and 1 teaspoon red chili sauce. 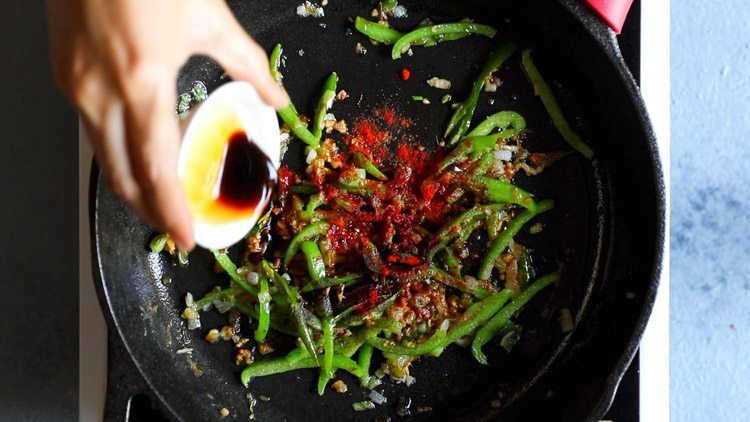 stir and mix the sauces and red chili powder with the remaining stir fried ingredients. add ½ to ⅔ cup water. mix well. let the mixture come to a simmer on medium to medium-high flame. meanwhile take 1 tablespoon cornstarch in a small bowl. 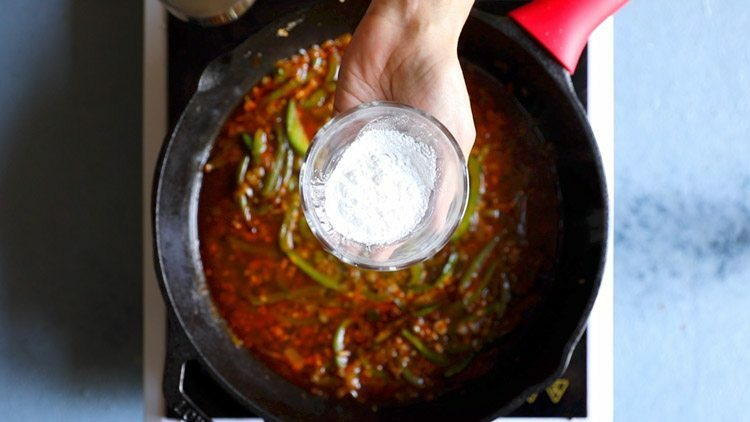 add 2 to 3 tablespoons water for dissolving corn starch. corn starch is known as corn flour in india. mix very well to get a smooth paste. 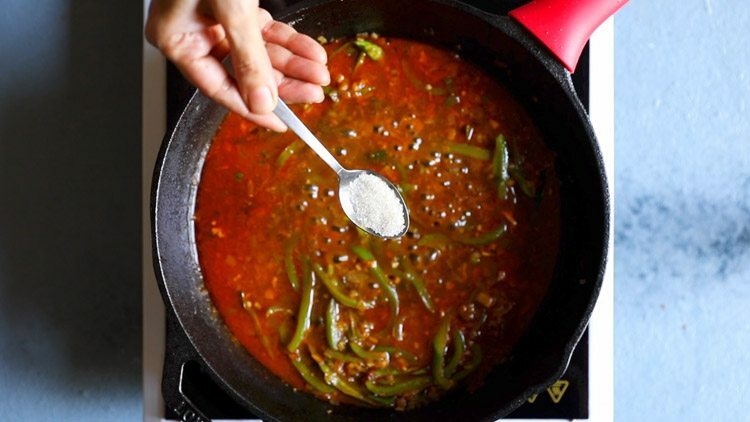 lower the flame and then add this corn starch paste to the gravy. as soon as you add corn flour paste to the gravy, mix the paste very well so that no lumps are formed. add ½ to 1 teaspoon sugar or as required. season with salt as per taste. do keep a check on salt as soy sauce and red chili sauce already have salt in them. 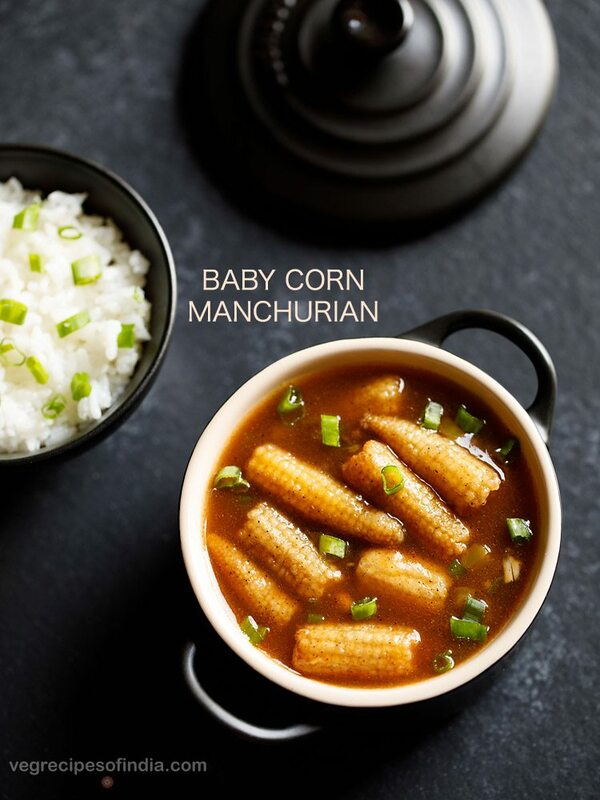 mix very well and simmer till the chilli paneer sauce has slightly thickened and the corn starch has cooked. you can check the taste and you should not feel any raw taste coming from the corn starch in the sauce. add the fried paneer cubes. mix paneer cubes very well with the gravy. 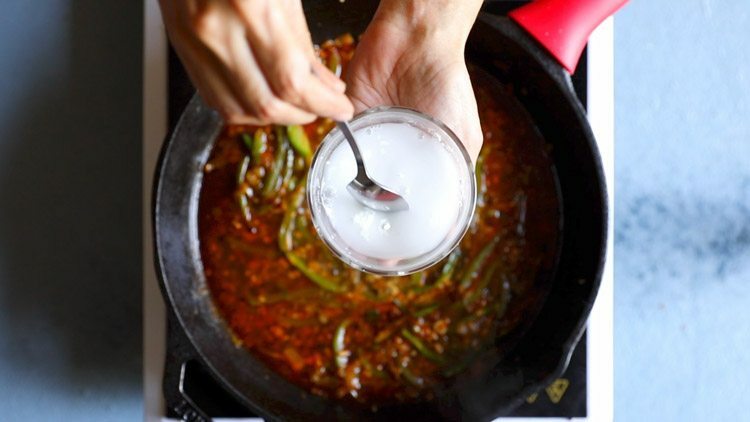 switch off the flame and then add ¼ to ½ teaspoon rice vinegar or white vinegar. you can skip vinegar if you want. then add about 2 to 3 tablespoons of chopped spring onions greens. mix very well. 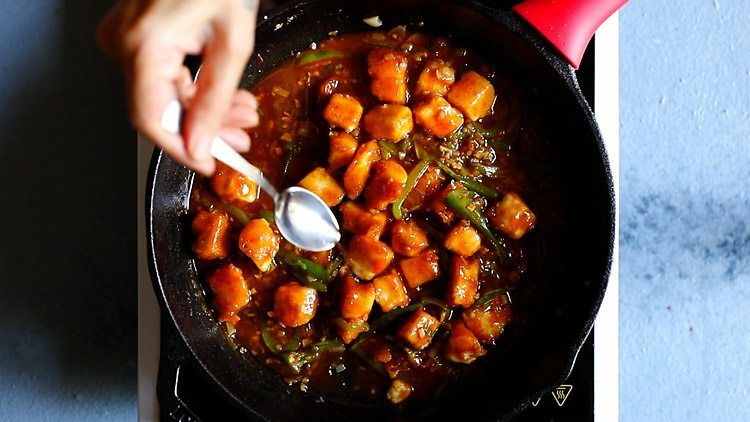 check the taste of chilli paneer gravy and if you want, you can add more soy sauce, chilli sauce, salt, black pepper or sugar. 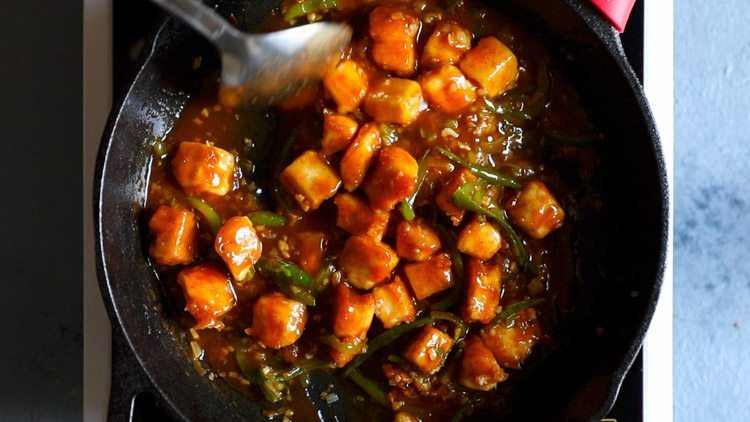 serve restaurant style chilli paneer garnished with some spring onions. 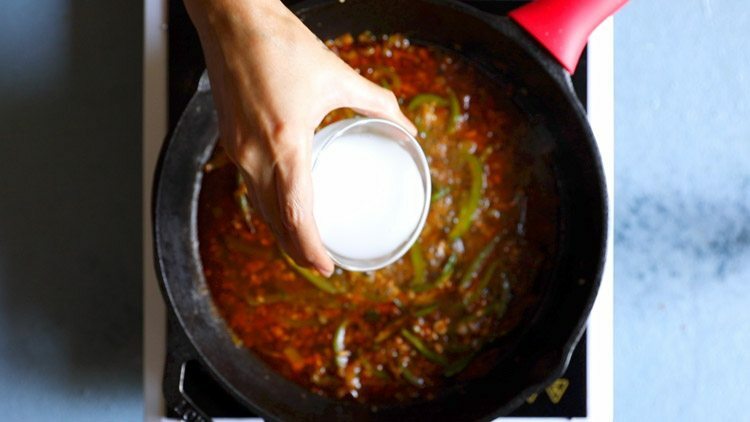 by adding less or more water, you can change the consistency of the chilli paneer sauce or gravy by making it thin or thick. 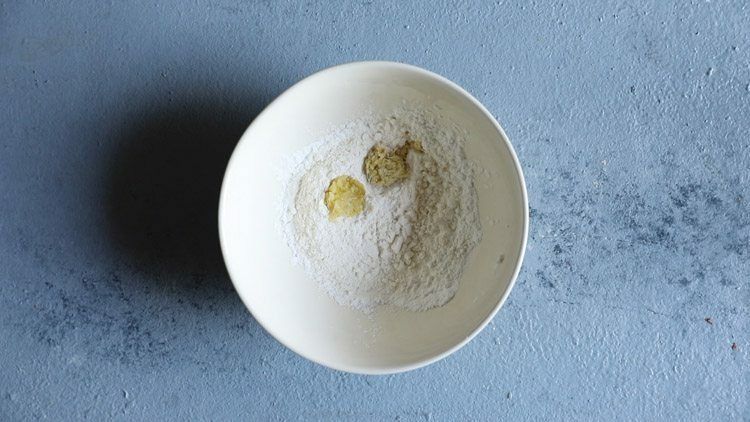 1. in a bowl take 2 tablespoons cornstarch. 2. then add 3 tablespoons maida (all purpose flour). 3. next add ½ teaspoon ginger paste and ½ teaspoon garlic paste. 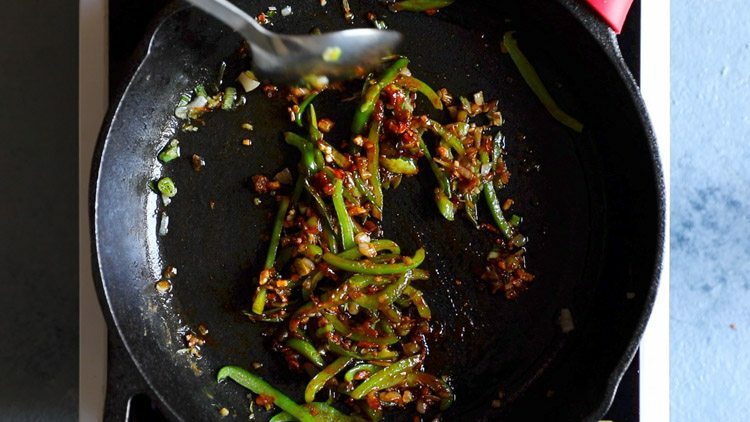 4. now add ¼ teaspoon crushed black pepper or black pepper powder and ¼ teaspoon kashmiri red chilli powder. also season with salt as required. 5. then add ¼ cup water or add as required. 6. with a wired whisk or a spoon mix very well to get a smooth batter without any lumps. the batter is of medium consistency. 7. now add paneer cubes in the batter. 8. with a spoon gently coat the paneer cubes with the batter. 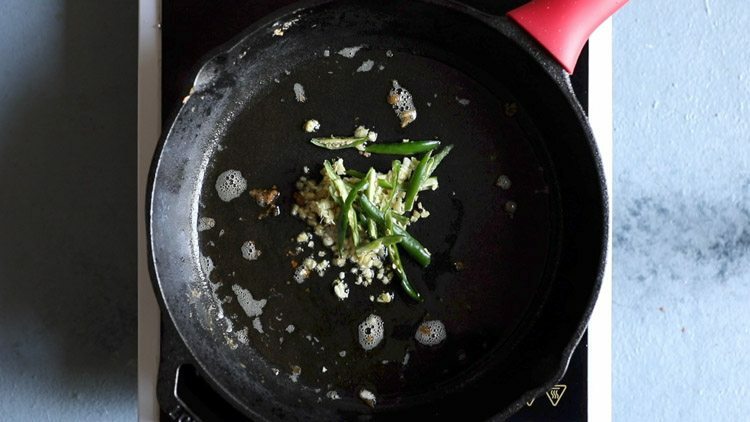 1. heat 3 tablespoons oil in a frying pan. i have pan fried the paneer cubes. you can also deep fry them. 2. once one side is done, flip it and fry the other side. 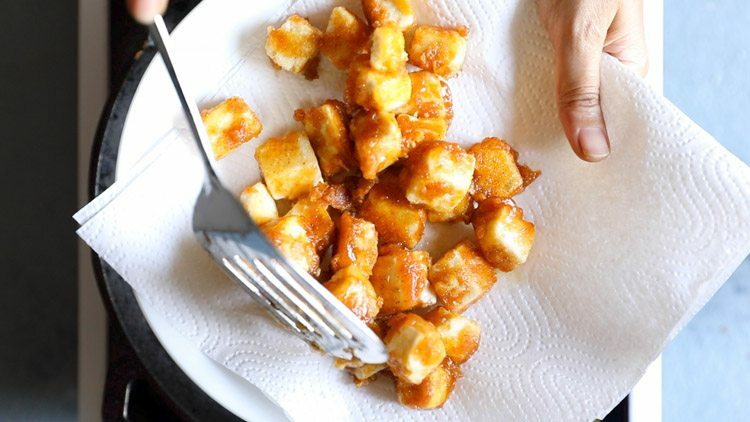 flip a couple of times and fry till the paneer cubes are crisp and golden. also do not over do the frying as then the paneer cubes can become hard. 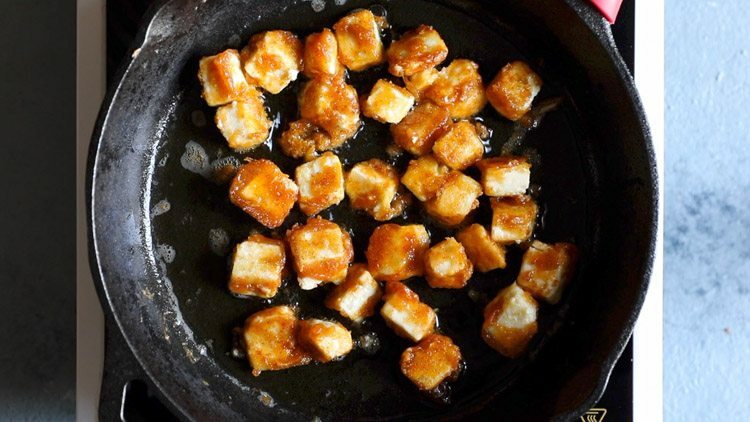 3. remove the fried paneer cubes and place them on kitchen paper towels for the extra oil to be absorbed. 1. in the same pan, there will be some oil left. so no need to add any extra oil. 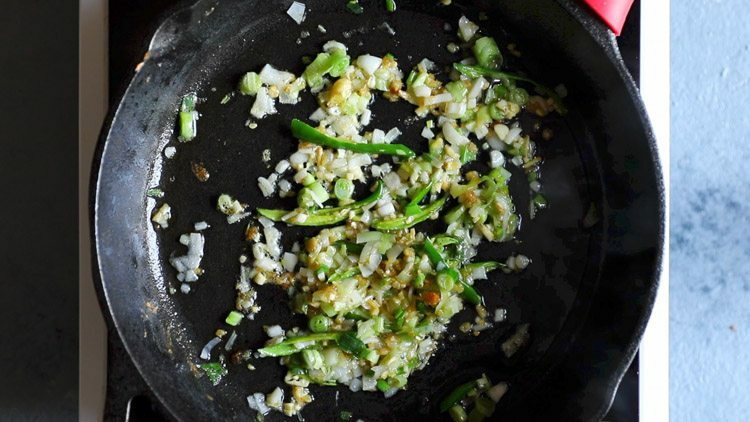 add 2 teaspoons finely chopped ginger, 2 teaspoons finely chopped garlic and 2 to 3 green chilies (slit or sliced). 2. stir fry on medium to high flame for some seconds. 3. then add ⅓ cup chopped spring onions. 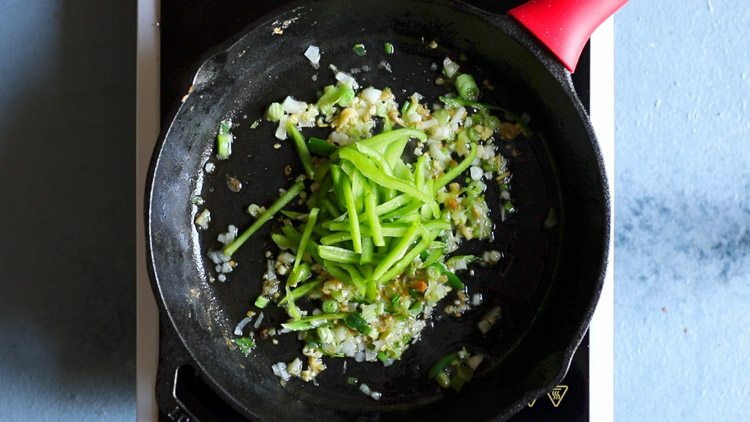 4. stir fry spring onions for 1 to 2 minutes on medium to high flame. 5. next add ½ cup sliced capsicum. 6. stir fry on medium to high flame for 3 to 4 minutes. the capsicum only needs to slightly cooked. 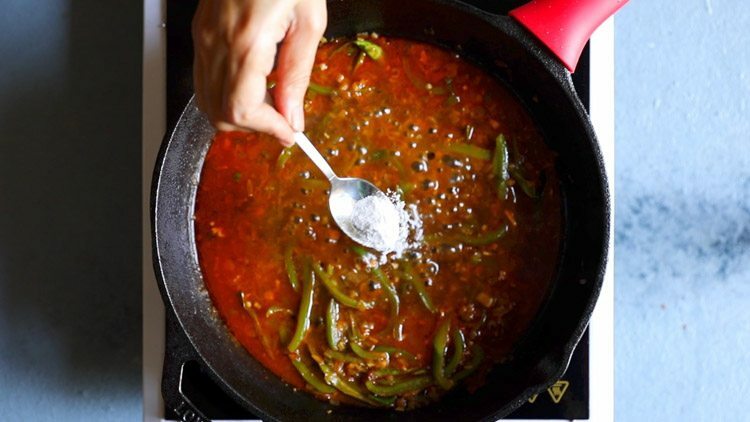 7. lower the flame and then add ½ teaspoon kashmiri red chili powder. 8. then add 2 teaspoons soy sauce. 9. next add 1 teaspoon red chili sauce. 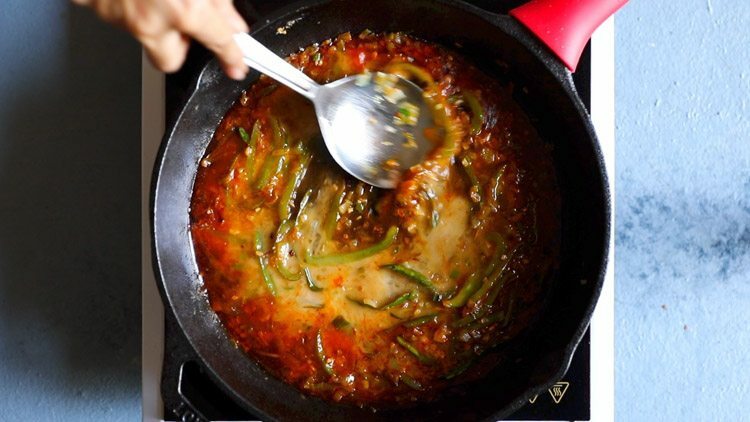 10. stir and mix the sauces and red chili powder with the remaining stir fried ingredients. 11. add ½ to ⅔ cup water. 13. let the mixture come to a simmer on medium to medium-high flame. 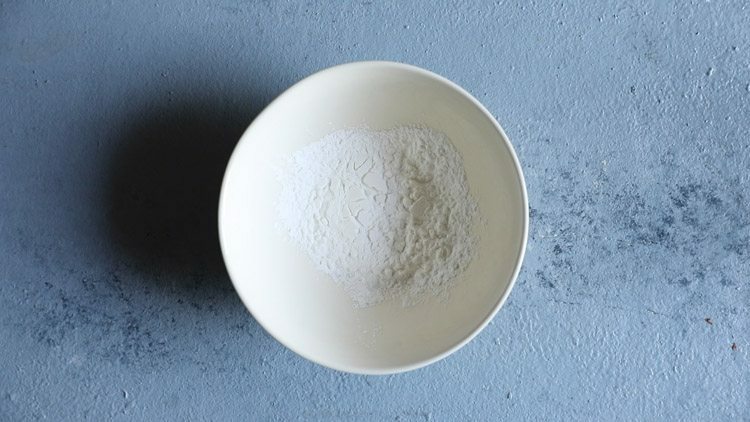 14. take 1 tablespoon cornstarch in a small bowl. 15. add 2 to 3 tablespoons water for dissolving corn starch. corn starch is known as corn flour in india. 16. mix very well to get a smooth paste. 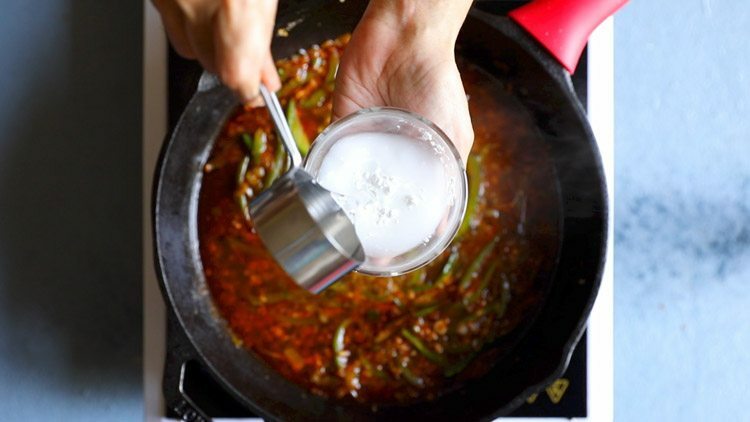 17. lower the flame and then add this corn starch paste to the gravy. 18. as soon as you add, mix the paste very well so that no lumps are formed. 19. add ½ to 1 teaspoon sugar or as required. 20. season with salt as per taste. do keep a check on salt as soy sauce and red chili sauce already have salt in them. 21. mix very well and simmer till the sauce has slightly thickened and the corn starch has cooked. you can check the taste and you should not feel any raw taste coming from the corn starch. 22. add the fried paneer cubes. 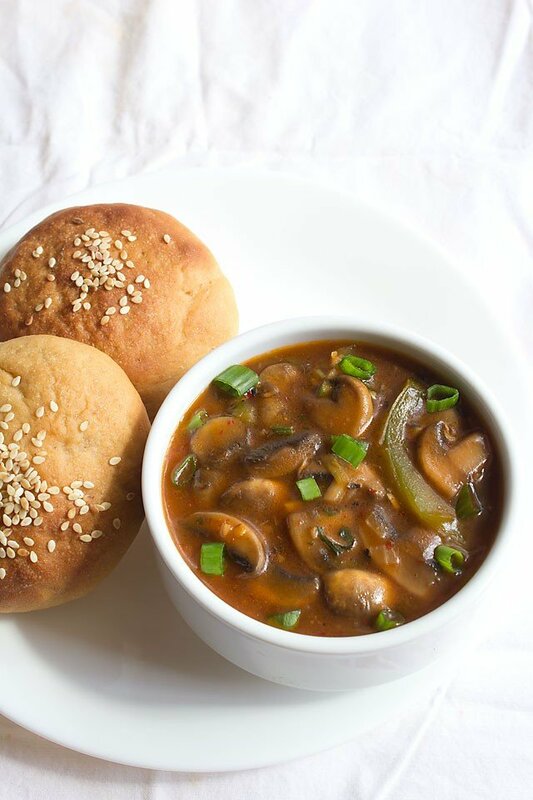 23. mix paneer cubes very well with the gravy. 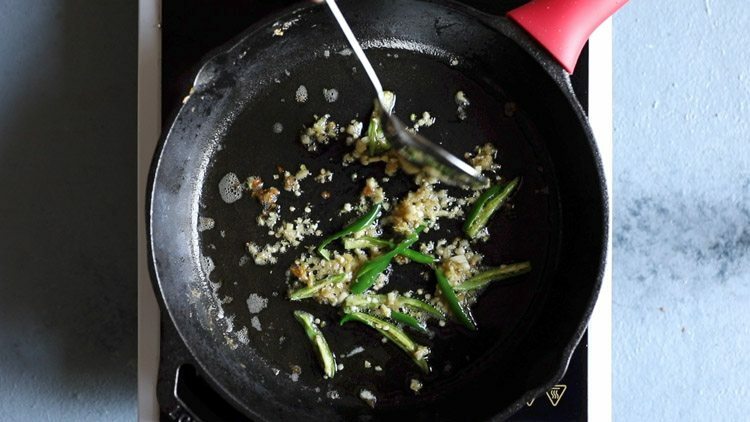 24. switch off the flame and then add ¼ to ½ teaspoon rice vinegar or white vinegar. you can skip vinegar if you want. 25. then add about 2 to 3 tablespoons of chopped spring onions greens. mix very well. check the taste and if you want, you can add more soy sauce, chilli sauce, salt, black pepper or sugar. 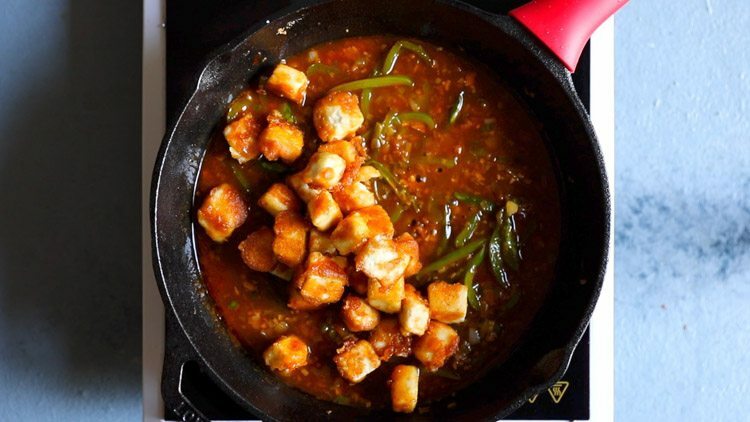 26. serve chilli paneer restaurant style garnished with some spring onions. 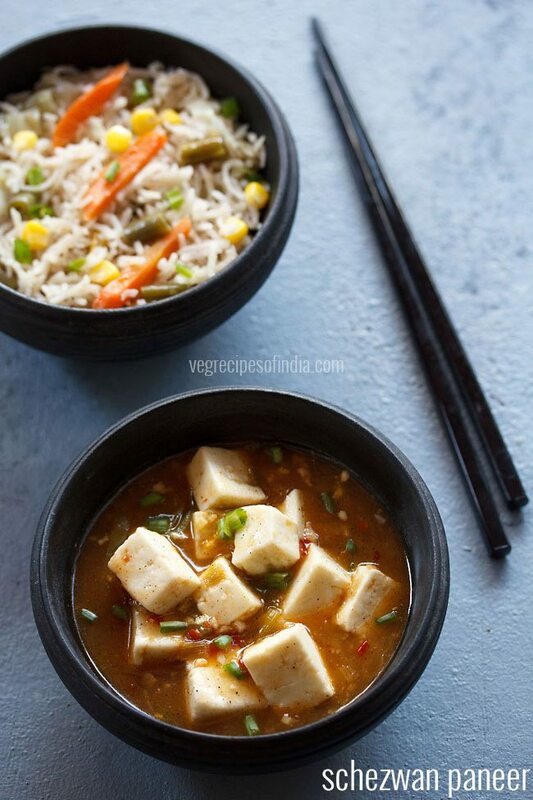 you can serve chilli paneer with any indo chinese rice recipe. chilli paneer also goes well as a side dish with veg pulao or jeera rice. you can also have paneer chilli with plain paratha or pudina paratha or naan. 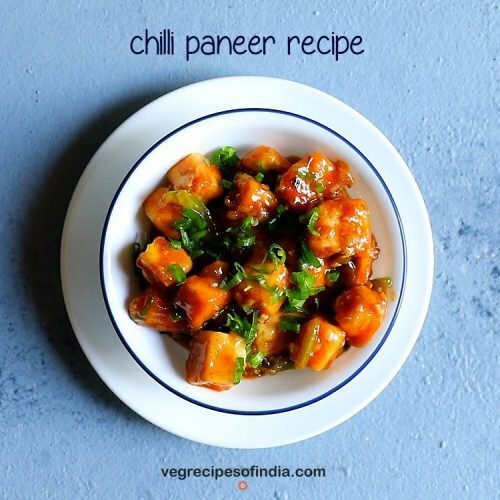 This is One of the best Chilli Paneer recipe that I found Online. 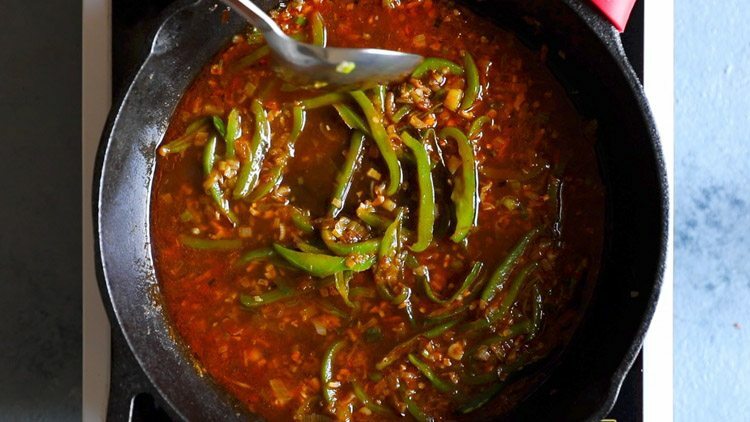 Spicy and delicious. Glad to have discovered your website. I will be trying more recipes from your website. thanks chirag and do try the other recipes as well. happy cooking. 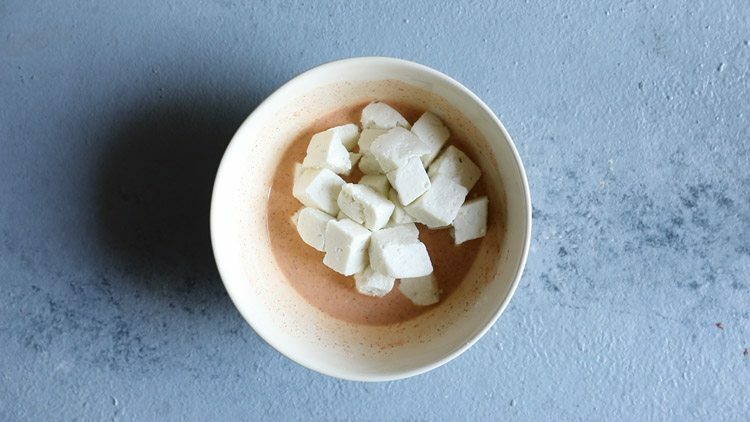 Very tasty recipe. Made it for friends and they simply loved it. Thanks. 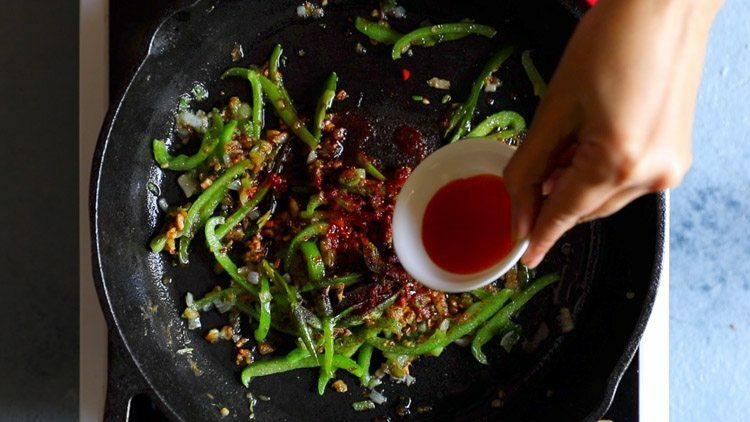 Which brand red chilli sauce do you use? Thanks for posting such great recipes.. you are always my go to! i am using thai heritage brand. Welcome Nancy. Glad to read your positive feedback and appreciation. Welcome Anagha. You can add some more water.